A leaflet dropped through my door offering an all inclusive (VAT + installation) price of £3461 for 1.44kWp of solar PV. I already have a 3.98kWp PV, which generated about 3000kWh in the year up to June 2012, so a 1.44kWp would have produced 3000 x 1.44 / 3.96 = 1090kWh of electricity. I also have a Renault Twizy. While it’s not a “proper” car, it meets most of my local transport needs with the same speed and convenience. Most of my personal travel, and about two-thirds of my annual mileage, is local: round trips of 30-40 miles or less. The Twizy carries two of us for an electricity cost of about 7 miles per kWh, so 1090 kWh of electricity is enough for 7,500 miles. This is more than we do, and more than our battery rental contract with Renault specifies. So for the cost of a Twizy and a half – just over £10k – I can buy a “solution” to my local travel needs that offers “free fuel” and zero carbon emissions! But what about the other running costs? As a member of the Eco Travel Network my Twizy costs about £1200 a year in insurance, battery rental, maintenance and roadside recovery. The cost of the electricity to charge it is about £90 a year and is relatively minor. Using the AA’s methodology, at 4500 miles annually, our Twizy costs us 26p per mile in standing charges (excluding finance and depreciation), and 5p a mile in running costs which include fuel, tyres and parking charges. This comes to about 31p a mile in total, and compares well with the 40p a mile the AA estimates are the costs for a small petrol car doing 5000 miles a year. So there are both environmental and financial reasons for buying a Twizy for local trips, but by itself the financial case isn’t as compelling as fuel costs alone would suggest. But what if we consider the running costs of a Twizy plus a 1.44kWp PV panel? 1. The government-regulated “feed in tariff” (FiT) which is currently 16p per kWh generated. 2. 3p for every kWh you “export” to the grid (estimated to be half what you generate). 3. Savings on your bill for the electricity you managed to use while you were generating. You obviously consume more electricity if you have a Twizy, and unless you manage to do all your re-charging while your PV panel is generating, that will increase your annual electricity bill by up to £90. Furthermore, a 1.44kWp PV panel, even at maximum output, doesn’t produce all the electricity a Twizy charger takes in real time. It will, over the course of a year, put back into the grid more than the Twizy takes out, just not necessarily while the Twizy is actually charging. The annual output of the PV panel, at 1090 kWh, will pay you £174 per annum in FiT. The electricity company assumes you export half your production (i.e. 545 kWh) and pays you 3p a unit for it, which comes to £16 a year. And since your electricity supplier assumes that you export half of what you generate, it seems reasonable to assume that you use the other half. 545kWh, at the rate your electricity supplier charges YOU for daytime electricity, would cost you £76 per annum at the current average price. This puts the total annual financial contribution of your 1.44kWp PV panel to £174 (FiT) + £16 (export) + £76 (reduction on electricity bill) or £266 per annum. That lowers the annual net running costs for a combined £10k Twizy + PV package by about 6p a mile, to about 26p per mile. This is a third less than the running cost of a small petrol car, and arguably 100% less carbon emissions. More importantly for me is the fact that a solar PV panel, if you can afford one, provides the perfect answer to those who say that electric vehicles are a bad thing because in reality they run on coal. While I can’t honestly claim that my Twizy doesn’t consume any coal-generated electricity, I can claim that it doesn’t require more coal to be burned to keep it running. 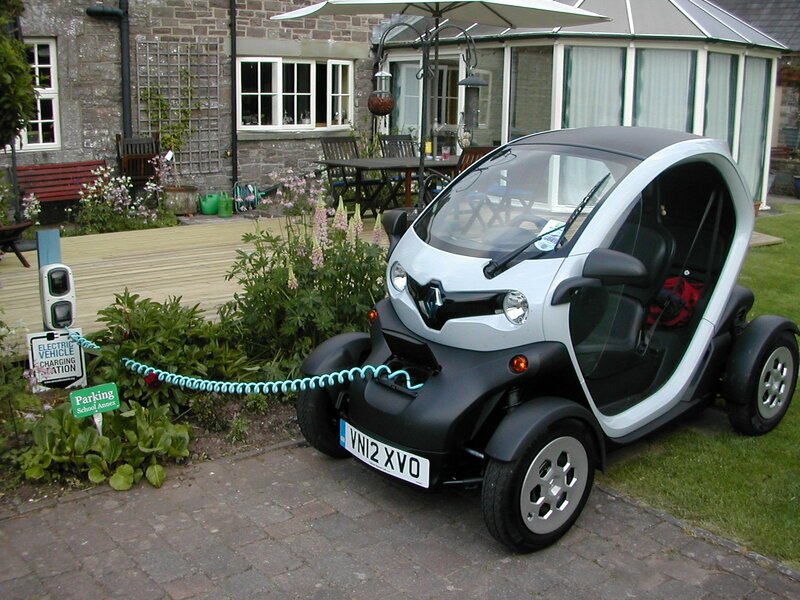 This entry was posted in Technology and tagged eco travel network, Renault Twizy, running costs, solar PV. Bookmark the permalink.